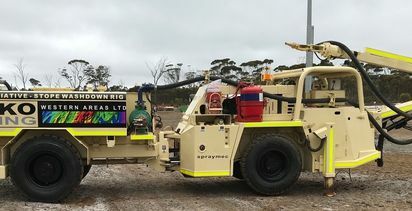 A breakthrough installation of advanced machine control technology at one of the world’s biggest bauxite mines has repositioned Western Australia-based Murray Engineering in the fast-growing mobile-fleet management and optimisation market. The company's automation & control systems manager, George Priest says the introduction of Murray's tele-remote control solution at the major bauxite operation in WA's south-west has "future proofed" vital overburden removal activity performed with a 180-tonne dozer, believed to be one of the largest commercially available dozers in the world. The operation relies on dozer remote control to keep operators safe and ultimately maximise the productivity of the waste mining activity. Dozers are used effectively across mines producing tens of millions of tonnes per annum of bauxite to rip caprock up to 2.5m deep that overlays the bauxite in most areas. The mining company has been using the method for some time rather than drilling and blasting the hard caprock, with the dozers also able to perform rehabilitation work. Getting operators off the dozers eliminated health and safety issues related to continuous exposure of machine drivers to the harsh ripping activity and conditions. Priest says the customer needed a remote control solution tailored to suit the demanding application. Murray Engineering's vehicle-mounted Tele-op System operator station replicates the functionality of the dozer cab. The full system also features four IP cameras and microphone sound detection running off a Wi-Fi communications network. Geo-fencing contains the remotely controlled dozer in a designated area. "We can provide a future proof system because we control the manufacture of all remote control components and circuit boards in-house with our partner Hard-Line Solutions"
A customised touchscreen user interface and controls ensures a seamless transition for the operator between the dozer cab and tele-op station. Priest says the user interface features J1939 telemetry, engine data, geo-fencing status and alerts, three video displays, and machine functionality control. 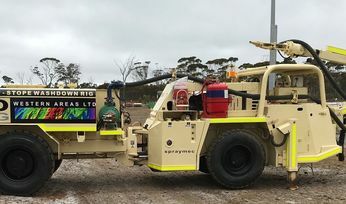 Fail-to-safe laser protection interfaced to the tele-remote system scans and monitors the area between the active dozer and the tele-op station to ensure the machine is always at least 8m from the control area. Priest says user feedback since the December 2018 commissioning of the system, and operator training, has been extremely positive. "Many of the operators have said having technology at their fingertips that is easy to use is extremely unusual," he says. "We were viewed by the customer as a partner rather than a supplier, one that shared the ultimate vision of increasing production and protecting the operator from machine-to-human interaction while operating the dozer on remote control. "This deployment is very important for Murray. "It has given us the opportunity to demonstrate our full capabilities in this area - interfacing different technologies that has not been done before, such as laser protection systems, collision avoidance systems and the geo-fencing solution, which we incorporated into a user-friendly touch screen user interface." Priest says the versatility and scalability of the Murray Tele-op System is important for the future. "We can provide a future proof system because we control the manufacture of all remote control components and circuit boards in-house with our partner Hard-Line Solutions," he says. "Murray Engineering utilised Cisco digital communication equipment which is non-proprietary and LTE-ready, which the customer requested. "We have developed the software with expandability in mind and that was critical to the award of the project. "We can seamlessly add safety and fatigue monitoring systems, or integrate with a fleet management system, and this is probably inevitable in future because of the importance of the dozer operation and plans for its use over the next 10 years and beyond." Semi-autonomous dozers pushing the limits!